World wide cinema, and lovers of Wide Screen Cinema in particular, were dealt a sad blow by fate at the tail-end of last year with the passing away of one of the greatest (some say the greatest) cinematographer ever, Britain's Frederick A. Young, known professionally - and credited as well, as "Freddie". Freddie Young at home. Picture from the book "Seventy Light Years" (Faber and Faber 1999). Freddie Young achieved a dazzling hat-trick, unequalled and unrivalled, in being triple-Oscared for three movies, all of which premiered in the 70mm format, leading them a scale and distinction that, despite the punctilious direction of master craftsman director David Lean, would have unquestionably remained wanting without the contribution of the great Frederich A. Young's camerawork. - The 1962 Academy Award for "Lawrence of Arabia" (1962) was one of the best deserved cinematography Oscars ever. Freddie surely earned it not merely for his sumptuous Super Panavision 70mm lensing, which revealed every pore on Peter O´Toole´s face, every grain of sand in that desert, but for putting up with one of the most demanding location shoots in movie history, and with one of the most belligerent and difficult (but talented) directors of all time. Images abide in memory, and both Lean and Freddie enjoyed the privilege of seeing their original 70mm negative fully restored to win another generation of admirers from amongst those who may have only encountered "Lawrence of Arabia" in 35mm scope, or, worse, on TV. The approach through the mirage of Omar Sharif, or the tumultuous train attack, as a bloodied El Aurence traverses the top of the carriages vainglorious and stimulated, the desert sun burnishing him with a halo - these are tremendous moments of pure cinema, freed from the constraints of plot or dialogue. How did Freddie achieve such images? "I just shot outdoors and stopped down", he famously - and modestly - once replied. Not keen to re-unite with David Lean, Young nevertheless answered the call to take over "Doctor Zhivago" (1966), which had begun shooting in 35mm Panavision with a totally unsuitable cinematographer [Nic Roeg, Editor]. 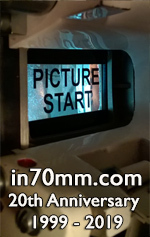 Freddie wanted to start over in 65mm, but that proved unworkable, so Freddie and Lean framed for 70mm, knowing that they would blow-up, premiere, and roadshow "Doctor Zhivago" in 70mm with full magnetic stereophonic sound (Which makes a mockery of the British Film Institute's proud acquisition for preservation purposes of a 35mm Dolby optical version - "Wish they'd called me in on the grading" was Freddies tart comment on that particular copy when screened at a London Film Festival). For 1965´s "Doctor Zhivago" Freddie won his second Oscar: Its a film of true magic in 70mm, all snow and fur and spring no matter that it was filmed in a sweltering Madrid doubling for revolutionary Moscow. There is a breathtaking luminosity to the camerawork that shimmers, and Young preferred it of all his three David Lean features because if afforded him "The greatest chance to try a variety of techniques". Five years after "Doctor Zhivago" David Lean chose Freddie Young for "Ryan's Daughter" (1970) a staggeringly fine-looking movie that was to be the last actually filmed in 70mm (The process was to be Super Panavision 70 again) for almost 20 years. Although critically derided and with a length that precluded a quick box-office kill, "Ryan's Daughter" won Freddie his third Oscar, and perhaps it is worth remembering that the Academy Award is a peer vote: all the cameramen voted Freddie Young their "guv´nor" on three separate occasions, and for three 70mm masterpieces. But Freddie´s widescreen association wasn't limited to working with David Lean. He photographed one of the early 70mm spectacles King Vidor´s Super Technirama 70 "Solomon and Sheba" (1959) with its magnificent battle scenes on the plains of Spain and Richard Brooks´ underrated "Lord Jim" (1964) in Super Panavision 70, reunited with his Lawrence, Peter O´Toole. Those who, like myself saw "Lawrence of Arabia" and "Lord Jim" at London's Metropole, Victoria, will forever associate Peter O´Toole´s piercing blue eyes and the saunter with 70mm in its glorious heyday. Freddie Young had served a long cinematic apprenticeship, and came to 70mm by the most logical of routes, via CinemaScope. As MGM´s favourite cinematographer, he had done splendid work on such movies as "Goodbye Mr. Chips" (1939) and a variety of films for the likes of Herbert Wilcox and Michael Powell (whose editor in those days were David Lean!) when he gradually revealed his skill with three-strip Technicolor in Disney's "Treasure Island" (1950) and John Ford's "Mogambo" (1953) winning an Oscar nomination for "Ivanhoe" (1952) with its fabulous Jousting scenes and the blaze of Torquilstone castle. "Ivanhoe" lead directly to the same team filming MGM´s first CinemaScope feature "Knights of the Round Table" (1953), and thus Freddie then photographed a terrific series of Borehamwood-based CinemaScope features: "Lust for Life" (1956), "Bhowani Junction" (1956), "The Inn of the Sixth Happiness" (1958), "The Wreck of the Mary Deare" (1959) - the way to shooting "Lawrence of Arabia" was clear. Freddie Young died at the age of 96 - he continued to paint with light in his latter years but as an artist not a cinematographer, and had exhibitions of his work. He often wrote about and spoke of his film technique, and in October 1996 was rewarded with the presentation of an OBE [Order of the British Empire, editor] by Queen Elizabeth II. I last spoke with him at a Kevin Brownlow/David Gill revival of "Sunrise" with orchestra at a reception after the film at London's Royal Festival Hall, and he made a fine last public appearance as the televised surprised subject of This is Your Life, accosted at a morning screening of the restored "Lawrence of Arabia" [London's Odeon, Leicester Square, Editor]. A sprightly-humoured, venerated and venerable technician, we'll not see his like - or sample his incredible well of celluloid experience - ever again.